Today I’ll share one of the secrets of financial health, namely the importance of your mindset for your financial destiny. You know that I’m very keen on maintaining my financial health and helping others to become, and keep, financially healthy. For me, financial health combines material wealth, emotional wellbeing and attitudes to life and money. In fact, smart people view financial health as an objective and wealth as a result of achieving it. 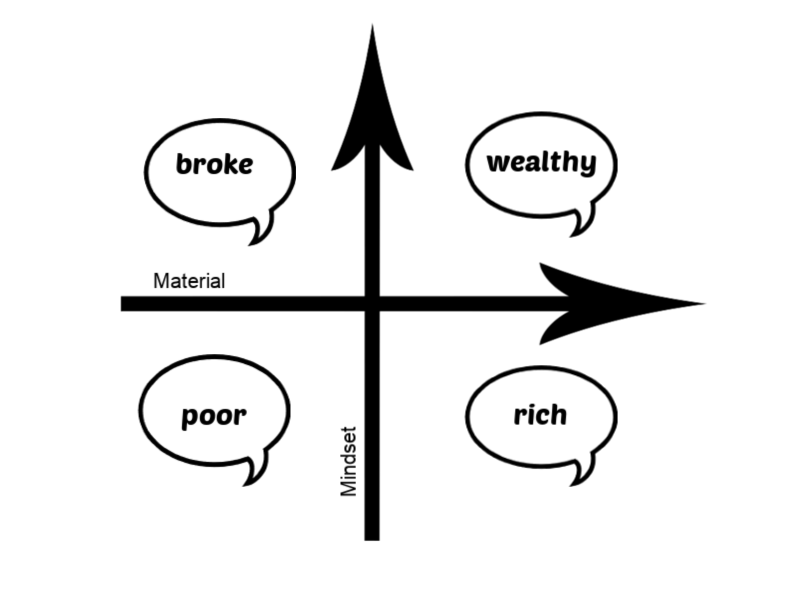 Today, I’d like us to chat about two dimensions of financial health, namely material wealth and mindset. You see, I believe this is important because these hide important secrets of financial health. What do I mean? Every time someone describes someone as ‘poor’ they have likely forgotten the importance of mindset and refer to material scarcity. Which, to be fair, was how the nuances of poverty were first elaborated. You’ve heard the expression ‘piss poor’, I suppose. Did you know that it used to describe a group of people who were so materially poor that they had to pee in a pot and sell their urine to tanneries? Now you can also guess why ‘not having a pot to piss in’ was very serious. Now, let me give you an impression of what these two dimensions – material and mindset – mean. Starting with the material dimension of financial health it refers to all possessions, income, investments etc. Mindset is a bit more complex than that and includes attitudes to possessions, money, people, time, education, worldview and driving forces. You can learn more about what constitutes a mindset. For simplicity we can think types of mindset and one possibility is ‘closed’ and ‘open’ mindset; or ‘positive’ and ‘negative’ mindset. It matters because this distinction can be used to characterise a very popular typology build according to our relationship to the material and to mindset. Have you ever wondered is there a difference between being ‘poor’ and being ‘broke’? Or between being ‘rich’ and being ‘wealthy’? We use these often as synonyms, but they are very importantly different. Can you place people you know, or you know about, in one of these four groups? What would you advise them to do to change group? Now, let us revisit the four categories – poor, broke, rich and wealthy – through the lenses of the material and the mindset. What makes the state of being ‘poor’ difficult to change is not the material side of things but the limiting mindset which prevents people from looking for opportunities or stops them recognising opportunities when these arise. Getting out of the state of being poor is hard, if not impossible because it critically depends on changing one’s mindset. This is turn needs energy, focus and determination which is in short supply. Poverty is exhausting and mentally taxing. Driving force is a dream of better future. Being ‘broke’ may describe one but it never defines him/her. People who are ‘broke’ have positive growth mindset – they look for and create possibilities; they understand that their material position in the world is about the life choices they make. Getting out of being broke is possible. I’d go further and say that it is highly likely. Still changing one’s situation in life takes persistence and determination. Driving force is amassing more wealth. Simply put, ‘rich’ are people who have ‘more than enough’ materially but lack the responsibility and morality to use this to make the world a better place. Because being rich still mean that one lusts after possessions, there is considerable ‘life cost’ inflation. E.g. people falling in this category are likely to trade their Ford for a Lexus and their Lexus for a Ferrari. They may even have several Ferraris in different colours. Many who acquire material wealth through inheritance or accident (lottery win, for instance) are ‘rich’; because they lack the mindset to go with material wealth their position is unstable – they either tumble back to being broke or develop a positive growth mindset and become wealthy. Driving force is contributing value and positive influence. Becoming wealthy is a great aspiration because this is a great combination of sufficient material wealth and positive mindset. This is a combination between riches and the responsibility to use them for making the world a better place. Where one fits in these groupings has important consequences for one’s future and capacity for wealth building. Two of these groups are financially healthy: being ‘broke’ and being ‘wealthy’. Your financial present and future is never a simple matter of how much money and possessions you have. One of the secrets of financial health is that developing positive growth mindset is equally, if not more, important condition for, and predictor of, your financial destiny. Mindset is the main difference between being poor forever and being temporary broke. Interesting delineation among the groups. I honestly think of broke and poor as being reversed. People who are self-described poor seem as or more likely than people who describe themselves as broke to strive to get out of it. “Broke,” to me, connotes a sort of shrug of the shoulders and an “I spent my paycheck too quickly. Oh well, what can you do?” whereas “poor” is more of a station in life that people are trying to get out of. But I suppose everyone’s definition is a little different. @Abigail: Interesting. I didn’t even think about the ‘shrug of the shoulders’ situation. I suppose this is what happens when I try to make the typology simple – it excludes people who earn decently and spend it all. Your last question will make me think about the people in my surrounding and their places in the groups you mentioned. I will be busy today. @Angela: Anything to report? Any people around you moved group?